This new product will benefit any rescue operation, UN, Red Cross or military units on the field. It can use solar energy to power its pump transforming dirty water into drinkable water within seconds. 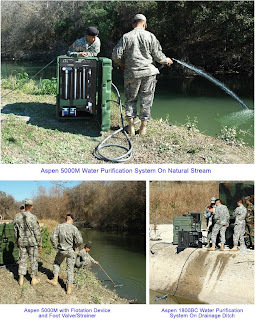 water purification system will supply 4,000 to 5,000 gallons per day (between 160 to 210 gallons per hour) of highly purified water from virtually any non-saline water source. Water can be drawn from ditches, rivers, lakes or standing water that may contain chemical and/or biological contamination. Water Treatment. The replaceable multi-media water treatment canister effectively treats 40,000 to 50,000 gallons of surface water containing contaminants such as lead, barium, selenium and arsenic, prior to replacement. It also removes high levels of manmade pollutants such as solvents, insecticides and petrochemicals. When used to eliminate possible microbial contamination in clear water, the canister may be used for up to 60,000 gallons. It is most effective when the flow rate does not exceed 3.3 gallons per minute. Disinfecting. An ultraviolet (UV) lamp system is integrated. Rated at 10 gallons per minute, it provides as much as three times the safety factor required by the US regulatory agencies and exceeds the World Health Organization’s standards for total disinfection. UV is much faster acting than chlorine and has been found to destroy 99.99% of all bacteria and viruses found in water, such as e-coli, cholera, typhoid, anthrax and polio. Additionally, the level of UV exposure in the 5000Model effectively inactivates minute organisms.